Sommers Generator Systems has been building its connections with the Greater Moncton area since the manufacturer opened its Atlantic Region office in Moncton in 2012. Sommers Generator Systems Jason Lichti presents a $500 donation to Tara Stirate of Isthmus Moncton. 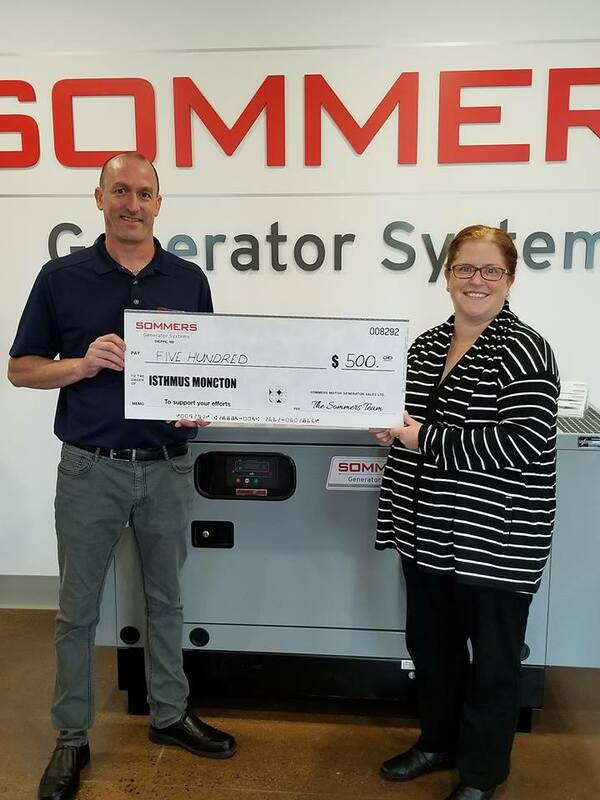 The recent Grand Opening of Sommers’ expanded showroom and parts warehouse in Dieppe provided the opportunity to make a personal presentation to one of its favoured local charities: Isthmus Moncton, formerly known as Blessings in a Backpack. The festivities also included a fundraiser barbeque for Moncton SPCA, door prizes and a contest hosted by 91.9 FM “The Bend,” to win a portable invertor system. Tara Stirate represented Isthmus Moncton at the event, and accepted a donation of $500 from Sommers’ Sales Manager Jason Lichti. Isthmus Canada is a nationwide project that aims to supplement school meals programs with nutritious food for children to take home on weekends. Proceeds from the barbeque also netted $517 for the SPCA, which included a $250 donation from Sommers Generator Sales and another $100 from visitors to the Open House. The new Sommers facility, located at 551 Ferdinand Blvd., gives Sommers a new showroom as well as expanded service and parts capacity to support customers throughout the Atlantic region. Isthmus Moncton, formerly Blessings in a Backpack, is a food program providing many youngsters in Moncton with healthy snacks on the weekend. The program hands out food every Friday to almost 360 food insecure children in 20 area schools. The program is a key to ensuring students are on more equal footing in school. For more information on the program or to make a donation, visit www.isthmus.ca or phone (506) 204-8250. Sommers Generator Systems has been a trusted name in generating, delivering and applying electrical power for over 80 years. Generator systems are Sommers’ only business. Today, Sommers is a leading Canadian manufacturer of packaged generator systems for residential, commercial and industrial applications, and stocks the nation’s largest privately-held inventory of generators for sale or rent from 3 kW to 2 MW.